I need to emphasize that organizations/states/people that are financing these employment programs are doing a good thing and thank them for that. This is especially important because they, unlike Employment Office, do not need to do it, it’s their goodwill. For the last few days, I’ve been thinking about what these programs are trying to fix, and I believe they are trying to fix consequences. Consequences of a malfunctioning system, that doesn’t take care that students are being educated for our own economy, that its enterprises have skilled workers, that rights of workers are being protected while enterprises are being supported to have their own products with research and development institutes and educations institutions oriented towards local economy. If you ask representatives of the employment programs in B&H what is the biggest obstacle they are facing during the implementation, they will tell you it’s a low interest among the unemployed population. I am not sure how this is like in the other parts of the world, but projects here are having a hard time to get people to work in the industry because working in the industry is not attractive. Wages workers in production receive are low, working conditions are often bad, as well as general perceptions of working in the industry. Yet, employment programs and projects are somehow managing to fulfill the foreseen indicators: train XY number of people and get them employed. Many people who are unemployed more than 10 years and who had lost hope they will ever work and have income, are getting employed thanks to these programs. But, even though this is needed, it won’t fundamentally change anything. Trainees are not numerous enough to make a difference. Their skills are not enough to make a difference. Their positions inside the enterprises won’t make a difference. They will weld metals, operate CNC machines, drive trucks, process wood, etc. They will help enterprises to survive (since enterprises in B&H are desperate for skilled workers) and enterprises will help them survive. But enterprises will stay in this inconvenient position, stuck between seeking new orders and hurrying to deliver previous orders, facing a number of obstacles in between. They will continue to be stuck in production, will low to non-existing activity in pre-production and post-production. In this situation, they can’t afford to pay higher salaries to their workers. They can be competitive either with their quality and innovative products or with their price, and they are generally competitive with low price. That is why workers generally shouldn’t expect wages that are competitive to ones in Austria and Germany (while taking lower living costs into account). It is clear to me that these things should be (and they are) tackled by other, non-employment programs, aimed to increase innovations in enterprises, competitiveness, export, greater finalization of the products, etc. But I think employment programs could also play a role. It’s understandable that employment programs are training people for vocations required by enterprises, it makes sense. But can employment programs contribute to dealing with causes a bit, besides dealing with the consequences (which is also necessary)? 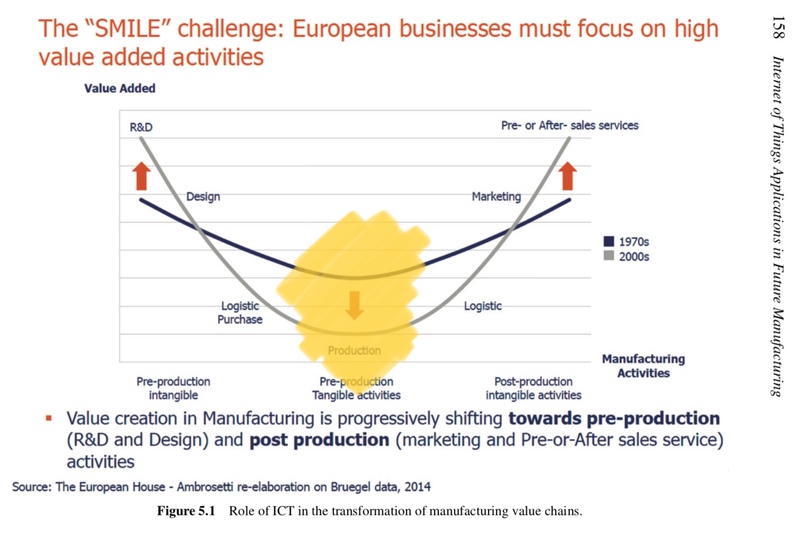 If we go back to SMILE challenge graph, to me it seems that our economy needs more presence of our enterprises at R&D, Design, Marketing and Pre- or Aftersales services. These are to be conquered if our enterprises want to have final products and sell them successfully, increase its value-added, and start moving away from this unenviable position of a provider of semi-products that is always in a hurry to meet the deadlines and always worried about the future which is mainly dependent of others. I believe this is worse for labor than for enterprises because enterprises in this position a) don’t need highly educated and skilled people (link to my previous blog about what kind of workers enterprises in Banja Luka need), and b) can’t afford to pay higher salaries to workers. Without people who bring in the skills and knowledge to firms I don’t see how this could happen, and without someone working on training new people to gain these skills, I don’t see where they could come from. It’s also important that there are enterprises who are ready to move to a position with higher value added. Why not try to find a few enterprises who are ready to move to a position with higher value-added and see if it’s possible to, in cooperation with experts from countries we export to and local experts, train people for these new professions that are needed for successfully managing the shift? Why not develop 5-6 different safe-to-fail interventions like this to learn about what works and what doesn’t, and what happens afterward?